Let’s start our top 12 list of actors who have some serious musical talent with some wordplay. The verb act is defined as ‘taking action/doing something’. Don’t get us wrong, we do believe that there’s so much more to acting and singing than what we are about to pull from this simple definition. Just for the sake of this wordplay we’ll say that actors are taking action, and musicians are doing something. No offense, we’ll explain. Namely, actors are taking action in every sense of this word: they’re saving the world, expressing every emotion known to humankind, they’re jumping, running, and some of them have great fighting skills – on and off screen etc. Ever wondered why movie directors say ‘action’ and not ‘do something’ right before shooting a scene? There is a pretty good reason for that, and unfortunately this little wordplay won’t solve that mystery. As opposed to actors, musicians are doing something with their voices, and that something is truly amazing. As defined by Wikipedia, what singers do is they ‘produce musical sounds with their voice’. They do something with their voice, and the result is beautiful. Now, the whole point of this wordplay was to discretely point out that there’s a connection between movies and music. Listing our top 12 actors who turned musicians, we’ll discover what happens when two worlds, music and movies, collide. We won’t be talking about musicals, but actors who have started their musical career. First on our list is Drake, a multitalented genius who has 10 number 1 singles on the Billboard Rap Chart. Now, Hold on won’t coming home. Well, we won’t be exactly going home, but back to Drake’s beginnings in the entertainment world. This talented actor/singer appeared in several TV movies and series from 2001 to 2005. At the age of 15, Drake got a first real chance at acting on the Canadian TV show – Degrassi: The Next Generation. From there, his acting career took off, giving him big roles in The Hangover Part III, Anchorman 2: The Legend Continues, Ice Age: Continental Drift… Need we say more? As for his musical career, it began in 2006. He won an ASCAP award for Most Performed Songs in 2010, 2011, and 2012. At BET awards 2014, he brought home an award for Best Male Hip Hop Artist. Actor or singer, we’ll have to agree he’s doing just fine. A musical wonder, Jamie Foxx, started playing piano at the age of 5. Many would’ve assumed he was born to be a musician. He, however, discovered that telling jokes and making people laugh is what he loved doing most. He is now among top Hollywood actors having starred in Horrible Bosses 1 & 2, Django Unchained, Ray, Dreamgirls, etc. Can he sing though? Jamie has a vocal range of 2 Octaves & 5 Notes, and has an unofficial title of an amazing yet underrated artist. Many people think that his acting career is overshadowing his music career. We could list all of Jamie’s hit singles, but we won’t. Instead, we want to show you how good Jamie Foxx really is – just give him a piano, and a random set of words, and he’ll make a song. Watch. Lindsay Lohan started her career as a child model at the age of three. She’s known for movies such as ‘The Parent Trap’, ‘Mean Girls’, and others. However, we’re more interested to know whether she deserved her spot on our list of actors who turned musicians. Lindsay released her debut album ‘Speak’ in 2004 that sold million copies, followed by her second album entitled ‘A Little More Personal (Raw)’. Now, how well did Lindsay do in the music business? She’s said to have a great voice, but her singing technique is said not to be that good. Her A5 note is described with one word – screaming. So, if she works a bit on her signing technique, who knows what she could do with her singing career. A proud dad of 5 girls and 3 boys, one of the biggest fans of Kylie Minogue, the winner of the ‘Favorite Voice’ award for playing Donkey in Shrek, our favorite Beverly Hills Cop – Eddie Murphy. His movie career is more than successful, but what about Eddie’s singing career? Eddie has five studio albums to his name including Love’s Alright, So Happy, Eddie Murphy, etc. These albums were recorded between 1982 and 1993. One of the reasons why Eddie put his music career on pause was probably because people expected him to do something funny in singing too. Below is one of his songs showing he really is a good singer. You got to give your audience what they want, and this is why Eddie’s cover of ‘I’m a Believer’ is much more logical. We’re not saying better, but just more logical. Hillary Duff is both an actress and a singer, and in her spare time she’s a teen idol. Aside from the fact that she can speak gibberish fluently, this young star can also sing. She has recorded four studio albums. She has a vocal range of two octaves and one note (her most loyal fans insist her vocal range is two octaves and two notes). On one hand, she has won a VH1 award for Best Breakthrough in 2003, and in 2004 she won an award for Best Selling New Female Artist at World Music Awards. On the other hand, she’s often accused of lip-syncing, and her singing has been described as flat singing in a sing-song voice. Now, we’ve given you some food for thought, and you decide whether Hillary’s turned out to be a good singer. Despite what many believe, Jennifer Lopez didn’t start out as a singer. She started her career as an actress and a dancer, and almost a decade later, she decided to try her luck in the music industry. She might not smoke or drink alcohol, but she sings, and has some pretty good dance moves to go with her catchy tunes. A lot of people will say that Jenny can’t sing, and that her audience is mainly male because she’s one of the Hollywood’s hottest stars. However, La Guitarra (a nickname Jennifer got for her body shape), has a vocal range of 5 octaves, and she sure knows how to make use of her singing capacity. Jennifer’s hit singles include: Jenny from the block, If you had my love, Let’s get loud, All I have, etc. Just last year, J.Lo won an Icon Award at Billboard Music Awards, so she’s got to be doing something right. Bruce Willis is a brilliant actor. Partly because of his movie roles and partly because of his though looks, he seems indestructible. It seems that whatever he puts his mind on, he can do it. Did you know that Bruno has his own video game? Now, for a change, we’ll let his fans say how they feel about his singing. For some people Hugh Laurie will always be Doctor House. Some, on the other hand, may realize they’ve found their new favorite singer after listening to Laurie’s album ‘Let Them Talk’. It seems as if Laurie knew he had some good music genes in him, and knew this would make people talk about his singing. What else could he do except let them talk. Doctor House appears to be a music doctor as well, as he plays the piano, guitar and the harmonica. His voice is quite an instrument as well. David Hasselhoff – the Hoff, a businessman, actor, a singer, and the creator of a social networking site ‘Hoff Space’. He’s best known as Mitch Buchannon from Baywatch, and a little less known as a music star. David just loves what he does – whatever that might be. If he feels like he should have music career, he does exactly that. He’s free to do that, and interestingly enough, freedom is the most used word in his songs. 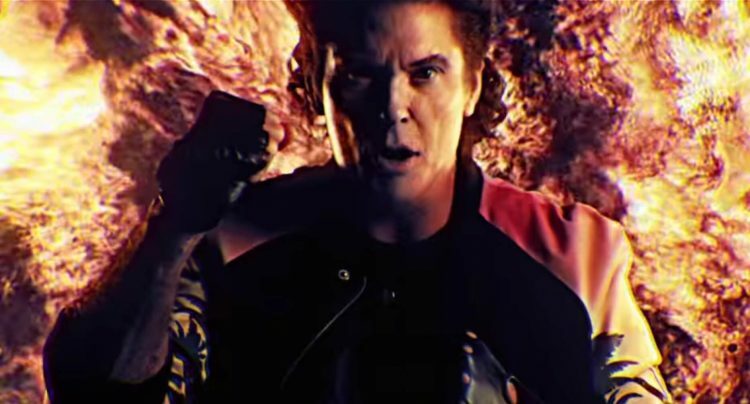 The Hoff is 1,93m, and has just as many songs packed in 17 studio albums. Unfortunately, his music is not as popular as he’d like, but as we’ve already mentioned – he looks like he has so much fun singing. Johnny Depp is one of the best Hollywood actors with a very strange habit of not watching his own movies. Some of his unforgettable roles include Captain Jack Sparrow in Pirates of the Caribbean, John Dillinger in Public Enemies, Sweeney Todd in Sweeney Todd: The Demon Barber of Fleet Street, and so on. Although he is doing more than great as an actor, Johnny has always had a dream of becoming a musician. When he was 15 he decided to drop out of school so that he could become a rock star. He did change his mind and wanted to go back to school, but his principal seemed to have supported his dream, and wouldn’t let him back to school. Johnny Depp plays guitar, and was a member of three bands, namely The Kids, Rock City Angels, and P. Music has always been a part of Johnny’s life, and if you don’t hear him sing, you’ll see him in music videos. He played the guitar in “Fade In-Out” (Oasis), ‘You’re So Vain’ (Carly Simon’), ‘My Valentine’ (Paul McCartney) etc. Scarlett Johansson is known for being an amazing actress and one of the most beautiful women in the world. One of the things she’s not that famous for is her voice, and she should be recognized for her great singing abilities. Most people don’t even know Scarlett can sing, and those who have had the opportunity to listen to her song compare her to Lana Del Ray. Scarlett has recorded two albums – Anywhere I Lay My Head and Break Up. While some say he voice is relaxing, and some claim it’s depressing, we say she sounds great. Jared Leto is an actor and director, but he’s also a lead singer in 30 Seconds to Mars. Alongside with his brother, Shannon, and Tomo Miličević, Jared has been making some pretty good music in the past 17 years. The band has recorded four studio albums, and has many singles that hit top of the charts across the world. Jared’s fame has never been a way of promoting his band, as he didn’t want the band to be famous for him, but for the music they make. As for the popularity of 30 Seconds to Mars, they have more than 80 awards, and millions of loyal fans. Guess, Jared really deserved a spot on our list. That’s the end of our top 12 actors who turned musicians, and we hope you’ve found some new singers you’ll listen in the near future. Who is your favorite actor who became a singer? Let us know in the comment section below.